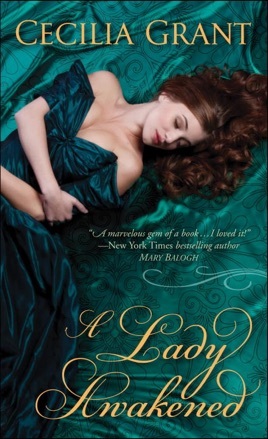 In Cecilia Grant’s emotionally rich and deeply passionate Regency romance debut, a deal with a rumored rogue turns a proper young woman into . . . A Lady Awakened. Newly widowed and desperate to protect her estate and beloved servants from her malevolent brother-in-law, Martha Russell conceives a daring plan. Or rather, a daring plan to conceive. After all, if she has an heir on the way, her future will be secured. Forsaking all she knows of propriety, Martha approaches her neighbor, a London exile with a wicked reputation, and offers a strictly business proposition: a month of illicit interludes . . . for a fee. Theophilus Mirkwood ought to be insulted. Should be appalled. But how can he resist this siren in widow’s weeds, whose offer is simply too outrageously tempting to decline? Determined she’ll get her money’s worth, Theo endeavors to awaken this shamefully neglected beauty to the pleasures of the flesh—only to find her dead set against taking any enjoyment in the scandalous bargain. Surely she can’t resist him forever. But could a lady’s sweet surrender open their hearts to the most unexpected arrival of all . . . love? Grant s debut Regency romance is sensitive and sensual. Determined to protect her estate and tenants from her nefarious brother-in-law, widow Martha Russell must produce an heir soon enough to claim he was fathered by her deceased husband. Her new neighbor, Theophilius Mirkwood, has been banished to the countryside for his rakish ways but a rake is just what Martha needs. She proposes to pay him for a month of clandestine interludes with the end result of conception. When Martha refuses to overtly respond to Theo s skilled ministrations, he becomes determined to give her pleasure as well as a son. Grant details Regency country life beautifully, with a firm and respectful hand, and the subtle yet engrossing courtship is enchanting and gratifying as it transforms these two strong-minded and very unlikely lovers. I'm surprised she even got published. The hero and heroine are unforgettable, their predicament scandalizing, and the overall book terrific. Can't wait for Book 2! !